Well, the wait is over and you have arrived to finally take your new puppy home. I want to share with you some things to expect that will help you in the adjustment period. Please know that you can Email or Call Us any time you need help. Your new puppy should start out by eating 2 times daily. I usually feed early in the morning when they get up, and another meal in the late afternoon. Start him or her out by giving 3/4 of a cup of food with some warm water on it. Place it down or in the crate and give him about 10 minutes to eat. If by then he has not eaten, take it up and give him nothing until the next scheduled meal time. This will help in housebreaking and training him to eat. Keep watch on your puppy and increase his food intake when you see that 3/4 of a cup is not satisfying his needs. Keep in mind that a puppy should not be overweight. 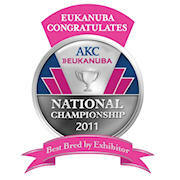 Stick with Eukanuba foods and biscuits and forget about all the treats you can buy at the grocery stores. They do not need them! Most of those treats have loads of salt and fat in them. DO NOT add table scraps — again you are inviting problems. I also use stainless steel dishes. These can go into the dishwasher to make sure they are very clean. Plastic dishes can be chewed and also plastic holds specks of food that can turn rancid and make your puppy sick. Standard Schnauzer dogs in general drink a lot of water, again another reason for not feeding store-bought treats. Fresh water should be available at all times. You may pick up the water in the evening around 9pm, to help get him through the night without having to go out. Take him out right before going to bed. Use lots of praise, not treats. Your new puppy is going to try to tell you that sleeping in the crate is just horrible. Don't listen!! Most dogs love their crates, but at first may need some convincing. Place a crate in your bedroom so that he can hear you breathing at night and he will feel more secure. Remember they are leaving their home and family for the first time so they will be unsettled for a few nights. Most of our puppies will sleep all night without getting up, so go to sleep and don't think that you have to get up through the night for the dog. Try placing your puppy in the crate when you see he is getting tired and falling asleep under the table. This will help get him use to sleeping while you are still doing things in the house. Having dog beds around is good also, but while trying to teach them about the crate it is better if you use it! If possible have a second crate down in the kitchen or family room, somewhere where he can see the activity during the day. Do not close them in a bathroom or basement, it will only cause you problems. Use the crate! I use a Kong toy to help crate train. Put a biscuit and or peanut butter in it and ONLY give it to the dog when placed in the crate. He should not see this at any other time. This will give him something to play with and work his mind while you are out. Most dogs will not soil in their crates but if that happens and you know he wasn't in there to long, take out all blankets or crate pads until you get this habit broken. Crate training is a very important training tool. With a dog being comfortable in a crate they are much calmer at the vets, grooming shop, and kennel, and are safer while traveling. Please don't have a collar on your puppy while in the crate. In fact I don't put collars on my dogs at all, except when we are going out. Unsupervised, they can get caught and choke to death. Believe me, it can happen. After sleeping or eating, your puppy will have to go out to relieve himself. You should accompany your puppy outside at the beginning of housebreaking. Remember again, he is away from his siblings, and they tend not to be as brave alone as when they had others around for confidence, so I would suggest you to go out with him and walk around until he potties. This should not be a playtime. Try walking him in the same place he has already relieved himself so that it smells familiar. Walking your puppy on lead is a great way to bond and socialize. Remember that he is still a growing puppy and should not be going for miles. Start out by taking him out for a 10 or 15 minute walk. Increase as he gets older. You should not be running with a puppy under 1 year of age. Standard Schnazuer puppies are very mouthy. They hold on to you by using their mouths. This can be devastating for young children thinking the puppy is biting them. The first instinct is to pull away and that's when it hurts. Let your children know that the puppies are babies and do not know realize sharp those puppy teeth are. Make sure you have lots of chew toys and plush toys available for you puppy. This also may be a good learning experience for children as they need to pick up what they don't want the puppy to consider their toy. It only takes one chewed up favorite toy of your child's to make them see what you mean. Please make sure your children have respect for this life your are about to bring home. The same goes for the puppy. Teach them that all adults are to be respected. If you do this from the start, you shouldn't have any problems with humans being the pack leader. Obedience classes are great for puppies. Some places also offer puppy daycare for you who don't want them home alone. These are great ways to socialize and have control of your dog while outside your home. Remember, having a trained dog in your home is one thing, but having a dog that you can take out in public and still have control is a wonderful thing. They need to see other people and dogs, hear noises they don't hear at home, and feel safe with you. It is great fun to be able to take your dog everywhere. Your new puppy will have had some of his puppy shots when you pick him up. 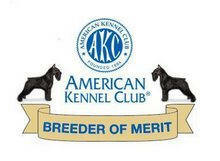 You will also be given a health certificate, shot record, and pedigree. Your new friend should go to your vet within a few days of arriving at home. He may not need any shots, but you should establish him with your vet. You will need to talk about heartworm prevention, rabies shots, and when to spay or neuter. I prefer that rabies vaccine be given at 4 to 6 months of age and spaying or neutering between 6 months and 1 year. Grooming will be done when you come to get your puppy. I will also instruct you on how to take care of the ears. This is also on our website. Grooming should be done by you or your groomer every 4 to 6 weeks. Grooming is very important and should be done on a regular basis. If you would like some help in learning how to groom your dog, I will be glad to help. If you're not going to have time, then please visit your groomer when you get your puppy home, just to check in and make a appointment. You have just bought a Standard Schnauzer of outstanding quality; please keep him or her looking like that. Nothing upsets me more than to see my dogs looking like junkyard dogs! If you would like the coat longer in the winter, ask your groomer to use a longer blade. Don't skip grooming just to let the hair grow longer. Ears and nails need to be done, so keep going all year round. Coats grow thicker in the winter months, and grow faster and longer in the summer. Teething will start at 17 weeks of age. That's when those needle teeth will finally be gone. The four large canine teeth will be the last to go. During this time it is very important to tape or put mole foam in the ears. If they are standing before the teeth start to come out without mole foam, great — but many times the ears will weaken and fall down during the teething process. You need to be consistent with putting them up at this time. Once the adult teeth are in, chances are they will NOT stand. I put a lot of time and money into having your puppies ears cropped, so please be consistent with this. Natural ears also need to be taped at this time to keep them from standing. Please check our link to see how this is done. My phone number for your vet, groomer, or trainer to ask questions. Your puppy will have been microchipped. Please don't hesitate to call me if you have a question or problem. Crate or crates, approximately 32" L X 22" W X 24" H. Do not get a crate that is too large. This size will be fine for the life of your dog. Food. We will supply you with a small bag of food to make the transition to what food you choose. I have started to feed all natural food. We feed raw meat in the mornings and kibble in the evening meal — Blue Buffalo, Royal Canine, Canadae, or Eukanuba natural. Our puppies are weened onto raw meat and yogurt. I find this gives them more lean muscle. Skin Bond for gluing ears. (This can be found in any pharmacy that carries hospital supplies.) Natures Farmacy carries the glue and remover. If you think of these things before your new puppy comes home, you will be able to relax and spend more time with him!! And, if you'd like to do some additional reading, take a look at the Dog Owner's Guide online magazine — they have lots of free info.